If you’re a Georgia resident, you probably already know that your home state is full culture, history, and a ton of Southern charm. But did you know that Georgia is also home to a handful of college records? In 1785, the University of Georgia became the first public university in the United States. Wesleyan College in Macon was the first women’s college in the world. Georgia also happens to host the world’s largest contiguous college campus, which can be found at Berry College. If want to take part in your state’s rich history of education, there are countless sources of funding that can help you get there. Check out the four steps that all Georgia residents should follow before embarking on their college careers. The first thing all prospective college students and their families should do to be considered for financial aid is fill out the Free Application for Federal Student Aid, better known as the FAFSA. We won’t lie to you — the FAFSA can be a bear to complete. With over 100 questions to respond to, it is likely the most thorough form you’ll fill out in your search for college funds. However, the FAFSA is crucial to be considered for federal or state financial aid. Our convenient FAFSA guide can walk you through the FAFSA item-by-item if you find yourself confused about how to respond to a question. You can fill out the FAFSA even if you don’t know where you’re planning to go to college. As a matter of fact, some grants and scholarships have deadlines before colleges send out their acceptances, so it’s best to be proactive and complete your FAFSA as soon as you can. Although you may automatically qualify for some state grants just by filling out the FAFSA, many grants require a separate application. There are also a few state-funded Georgia scholarships awarded for merit or service in the armed forces. A complete list of Georgia state grants, scholarships and loans funded by the Georgia Student Finance Commission can be found here. Once you’ve applied for federal and state grants and scholarships, the best way to stay on top of additional scholarships is by talking to your school guidance counselor. Set a monthly reminder to check in with them—many local, statewide and national organizations go directly to school guidance offices with funding opportunities, so they can be an excellent and up-to-date resource for you to use. Some Georgia schools automatically consider students for certain scholarships after they’ve filled out the FAFSA, but many other scholarships require a separate application. Georgia State University, for example, offers several scholarships for students applying in- and out-of-state, but their most generous awards ask for an additional application and recommendation letters. No matter where you’re applying, it’s always a good idea to do some research of your own. Take some time to call the financial aid offices of the schools you’re applying to and search their websites for scholarship opportunities. You may also want to do a broader scholarship search online. Websites like scholarships.com and GAfutures allow you to search by location, academic major, extracurricular interests and more. You can also apply for one of our scholarships. Here at Nitro, we are proud to offer our Nitro Scholarship and Nitro Parent Scholarship. Both scholarships award $5,000 to a new winner quarterly, and applicants can even win $1,000 just for referring a friend. If you find that you’re still in need of tuition assistance after grants, scholarships, and federal loans are accounted for, a well-researched private loan can help you cover the cost of your degree. 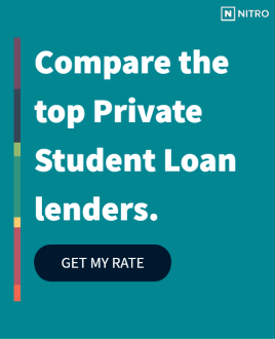 You can look through our list of the best banks for private student loans to decide which repayment option will work best for you. Before committing to a private loan, try out our free NitroScore tool to estimate how feasible it will be for you to pay off your loans after graduating. All you have to do is enter your school, desired major, and available funding. Our tool then gives you a score based on the amount of loans you will need and how much of your projected salary you would need to put towards paying them off. Earning a college degree should be a possibility for all Georgia residents. Take advantage of the resources you have by getting started today.